When you put something under the microscope, you take a closer look at it in order to better understand it. That’s what I want to do in this series. I want to take a closer look at some of the common questions/objections to the Christian faith in order to see if there is something wrong with what we believe. 1) I want to encourage you to ask questions about what Christianity says is true. 2) And I want you to be better equipped to engage and reach those around you who don’t believe in the gospel. What is the worst punishment you’ve received? Dad who were jean shorts all around town in response to his daughter wearing clothes her mom and dad didn’t approve of. Dad who shoots daughters computer in response to something she posted online. The second one is clearly an over-reaction. It’s giving a punishment that seems so far over the top that it’s ridiculous. I wonder if when we think about Hell, we picture God in this way? As the out of control Dad whose punishment seems harsh and unfair. It’s a very serious and very good question to ask. Especially if we may not personally be a Christian or if some of the people that we know and love are not Christians. And my initial response in the form of a Big idea might shock you, but stick with me and I hope you’ll see why I believe the following statement is true. Big Idea: Hell magnifies God’s love. In other words, hell actually helps us to see, understand, and appreciate the depths of God’s love for us. Behind every question is a set of beliefs. A loving God is a God who judges. Hell is life apart from God. Hell should bring joy to our heart and urgency to our hands. 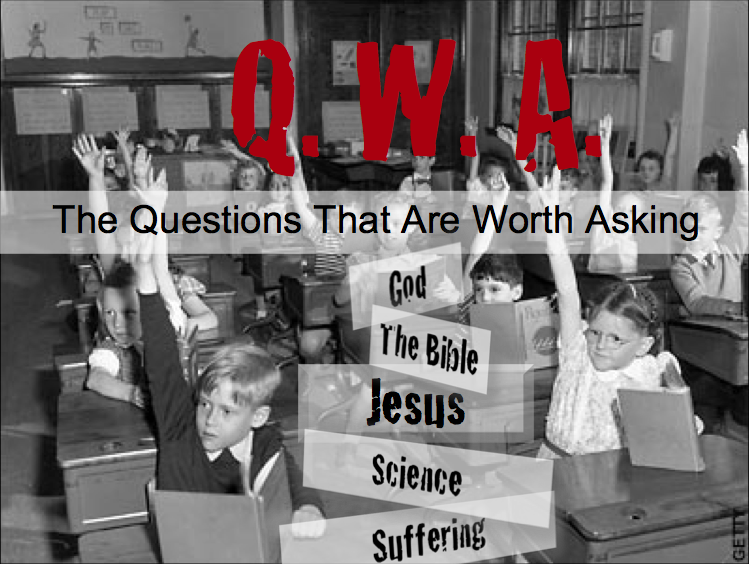 Q.W.A #4: How Can a Good God Allow Suffering and Evil? Attention Funnel: Insurance Commercials – We buy insurance because bad things happen. Introduction: Bad things happen in this life. We all know this, there are things that happen that cause pain and suffering in our lives or in the lives of others. This issue of suffering and evil in our world is one of the biggest arguments against God’s existence. It’s a problem. Big Idea: The existence of suffering does not mean that God is unloving or weak. Christianity provides a framework for understanding evil and suffering. Christianity tells us that God suffered for us. Q.W.A #2: Is There Any Evidence for God’s Existence? I want you to imagine that you are in a courtroom with me tonight. I want to put before you certain pieces of evidence, and I want you to ask with me, does this evidence point us toward a God or away from a God. We CAN’T prove that God exists beyond a shadow of a doubt. That may sound like a dumb thing to begin with in a lesson on wrestling with doubt about God’s existence, but it’s true. I can’t offer you any single proof that God exists that will may you believe in God beyond any doubt. But, there is evidence that we can weigh, and we can ask, “Does this point us to believe that God exists, or the opposite? What I am trying to do, is to lay before you several things that we know about this universe and ourselves and to ask – does this point to a God who created the world, or does it point to a world that came about by chance apart from any creator or designer. I’m going to do this through pointing out some of the things we know about this world, and then point out one thing we know about ourselves. I’ll finish by pointing out the hope that is found in Christianity alone. Big Idea: There are clues that point us toward the existence of God.